WHAT IS BICEPS TENDONITIS (AKA: TENDINITIS) AND WHAT CAN YOU DO? Tendonitis, tendinosis, and tendinopathy are frequently used terms that mean different things. These terms, in fact, are often used incorrectly and require some clarification. An –itis, –osis, or –opathy all indicate that something has gone array, which has led to too much pressure, tension, and stress accumulating in one part of the soft tissue in the body. An –opathy, such as tendinopathy, refers to a classification of tendon diseases, such as tendonitis and tendinopathy. Used to describe inflamed tissue, -itis happens because of acute trauma or stress. Inflammation is the body’s natural response mechanism and usually shouldn’t be interfered with as it is due to micro-tears from the tissue being overloaded. –Osis differs from -itis because there is no inflammation and it’s associated with chronic or long-term tissue stress. Tendinosis, for example, implies that the chronic stress has led to degeneration at the cellular level (Armstrong & Hubbard, 2016). When this happens, the tissue begins to degrade. Tendinosis is diagnosed by a clinician through palpation and resisted muscle testing. If you suspect you have tendinosis, consult with your physician. However, self-intervention can often help when it comes to tendonitis. Therefore, the rest of this article will focus on tendonitis. Tendonitis is in the category of overuse syndromes and usually plays an active role in conditions such as cumulative trauma disorder, repetitive strain injury, repetitive stress injury, and occupational overuse. The majority of overuse syndromes involve inflammatory responses, which are provoked by repetitive movements, stress, or sustained tension/exertion of a muscle group or tendon. Armstrong and Hubbard (2016) stated that tendonitis usually comes secondary to repetitive microtrauma that often produces fatigue and inflammation. Tendonitis represents infiltration of the tendon or fibrous sheath with inflammatory cells and mediators (Singaraju et al., 2008). As mentioned above, if acute, this is not associated with cellular degeneration. However, if the stress is not removed, then the inflammation will lead to a tissue breakdown overtime and the degenerative process begins (i.e., tendinosis). Posterior tibial tendonitis—midsubstance, posterior tibia. Surprisingly, one area that did not make Almekinders’ 1998 list, but is on the rise as a popular site for tendonitis is biceps tendonitis. Biceps tendonitis has been explained as an inflammatory process of the long head of the biceps tendon and is a common cause of shoulder pain due to its position (Ahrens & Boileau, 2007). The authors continued that one of the reasons it is so susceptible to injury is because it is exposed on the anterior shoulder as it passes through the humeral bicipital ground and inserts onto the superior aspect of the labrum of the glenohumeral joint. Thus, the tendon often sustains acute damage by being impinged in the subacromial space. Such an insult, over time, can easily lead to or at least contribute to biceps tendonitis. Also, biceps tendonitis is often associated with rotator cuff disease as a component of impingement syndrome (Singaraju et al., 2008). Due to the position, it is easy to see how overhead activities, such as hitting a tennis ball, throwing a baseball time-and-time again, and swimming can irritate the tissue initiating the inflammatory process. However, a four-year study of rowing athletes also revealed an increased prevalence in biceps tendinitis (Hadala & Barrios, 2007). 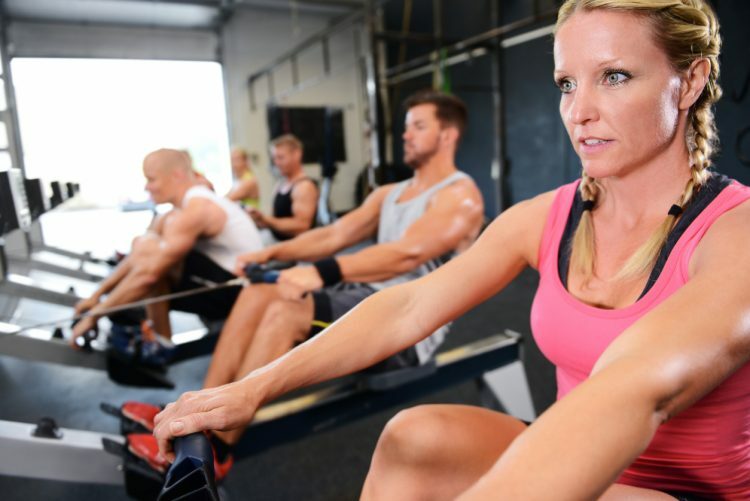 Such injuries may occur during rowing because the arm is moved into excessive abduction and external rotation, possibly causing direct injury to the biceps tendon. Therefore, biceps tendinitis may also show up in the left shoulder of a right-handed batter and the left shoulder of a right-handed golfer. Furthermore, the injury is not only sustained in competitive athletes but also becomes prevalent in the average gym-goer with the inability to properly extend the thoracic spine and demonstrate adequate length in the pectorals or latissimus dorsi. It is often clear to see how overhead athletes, whom subsequently performs explosive overhead movements over-and-over, may be subjected to a shoulder condition such as biceps tendonitis. However, anyone who can’t freely move their arms overhead yet forces the arms overhead, is also at increased risk of the condition. To fully understand how the biceps tendon becomes injured, it’s important to have a foundational understanding of the anatomy of the shoulder. The biceps has two heads that originate near the shoulder and merge into a common tendon to insert on the radius. Thus, the biceps have a functional role at the shoulder, and elbow–including supination and flexion. The short head of the biceps inserts external to the shoulder joint and is rarely involved in shoulder impingement and the subsequent inflammation that may lead to biceps tendonitis. However, the long head of the biceps passes through the bicipital groove of the upper arm, then turns approximately 90 degrees crossing the humeral head to attach to the upper edge of the glenoid labrum and supraglenoid tubercle. Therefore, the long head of the biceps tendon takes a peculiar route and has a unique stabilization and movement function of the entire arm. Allows for greater overall range of motion. Maintains optimal contact between the humeral head and glenoid fossa (scapula). Assists with maintaining optimal length-tension relationships for ideal stabilization, force production, and force reduction (Norkin & Levangie, 1992). 0-90 degrees of movement begins with the scapula setting against the ribs to provide initial stability as the humerus abducts to 30 degrees. 30-90 degrees entails another 30 degrees of movement from the humerus while the scapula upwardly rotates to 30 degrees. The upward rotation results from the clavicle elevating at the sternoclavicular and acromioclavicular joints. 90-180 degrees involves 60 degrees of additional movement from the humerus and 30 more degrees of upward scapular The scapula rotation is associated with 5 degrees of elevation at the sternoclavicular joint and 25 degrees of rotation at the acromioclavicular joint (Inman & Saunders, 1996). This information suggests that the key to both prevention and treatment is to restore mechanics of the entire shoulder girdle. The NASM Essentials of Corrective Exercise cites Bongers (2001), Urwin, Symmons, and Allison (1998), and van der Heijden (1999) stating that “shoulder pain occurs in up to 21% of the general population with 40% persisting for at least one year.” This suggests that shoulder pain, once it occurs, is very hard to treat. Thus, prevention is key. Identifying potential shoulder impairments, which may lead to shoulder injuries, such as biceps tendonitis, is quick and easy. The first step is to begin with a total body movement pattern like the overhead squat. An overhead squat is a great assessment tool because from the very beginning one can notice if the client is having a tough time getting their arms overhead. The arms should be fully flexed to 180 degrees (arms in line with the torso) for a set of three to four squats. If the arms fall forward, any amount, it indicates that additional testing is warranted. If the arms fall forward, the next step is to attempt to isolate certain movements at the shoulder, which will provide information as to what is the most problematic in the dysfunctional shoulder. These additional test will include isolated shoulder flexion, horizontal abduction, and glenohumeral external and internal rotation at 90 degrees of abduction. Begin the next series of tests with the clients back against a sturdy wall. The wall will provide the fitness professional with a better reference to help determine a more precise cause. During shoulder flexion, the client’s feet, hips, shoulders, and head should begin against the wall. Have the client lock out their elbows and slowly reach as far as they can overhead to touch the wall. If the clients low back arches then it indicates that the latissimus dorsi may be the primary cause of the dysfunction. With the client still against the wall and elbows locked out, have them reach their arms out wide all the way back to the wall. If the arms can’t reach the wall, it indicates the pectorals may be short. However, the most common compensation is elevation of the shoulder or shrugging. If this happens, it indicates that a short upper trapezius and perhaps scalenes are interfering with optimal shoulder mechanics. Again, against the wall have the client abduct the arms to 90 degrees. Then, externally rotate the arm, so the hand and forearm begin to move toward the wall. If the client can’t reach the wall, it indicates short internal rotators. Again, against the wall and with arms abducted to 90 degrees, have the client attempt to bring the hand and forearm down toward the wall, internally rotating the GH joint. If the client can’t move about 70 degrees (as determined by simple observation) without dropping the arm or tipping the scapula forward, it indicates a problematic posterior capsule. Two of the most common compensations observed is the inability to move the arms into full shoulder flexion and a lack of internal glenohumeral rotation. If these are noticed, regardless if there is shoulder pain yet, a CEx program should be implemented as part of movement prep. Latissimus dorsi: Get into a side-lying position with the foam roller positioned toward the bottom of the shoulder blade. Slowly roll all way up to the armpit and the back of the shoulder joint. Posterior capsule: Position a massage ball just behind the shoulder joint, on the rear deltoid. Thoracic spine: In a supine position, slowly roll the length of the thoracic spine. Perform shoulder flexion motions to encourage thoracic extension. Latissumus dorsi: Take to the first point of tension and hold for 30-45 seconds. Sleeper Stretch: Side-lying with the arm abducted to 90 degrees and shoulders stacked, slowly internally rotate arm with opposite hand and hold for 30-45 seconds. Thoracic Extension: In a supine position with a foam roller positioned mid-thoracic spine and hands supporting the head, slowly lean back to the first point of tension. DO NOT let bottom ribs flare up as this indicates the lumbar spine is beginning to extend. Stability Ball Cobra: Perform 10-12 reps with slow tempo. Ball Combo II: Perform 10-12 reps with a slow complete movement that is: a) row; b) external rotation; c) press (shown below); d) pull down; e) eccentric internal rotation, and f) eccentric press. GH IR: Perform 10-12 reps with a slow tempo, supine w/tubing and 90 degrees of abduction to reduce pec major and latissimus dorsi assistance. Bear Crawl: Maintain shoulder blade stabilized against ribs cage—perform 20 walks forward. Wide-grip Row: Perform 15-20 reps with a slow tempo and light resistance.